As 2011 comes to a close I'm dreaming of all the good junking to come in the next year. Is that you too? Dreams of mega scores and holy grails? 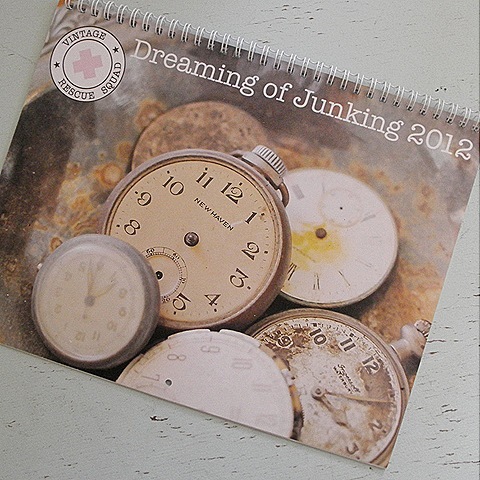 Perched on my fridge already is a copy of the 2012 "Dreaming of Junking" calendar by my friend Sue over at Vintage Resque Squad. Sue also called upon her junking friends to provide some totally awesome pictures of favorite finds to keep you permanently in that junking mood. 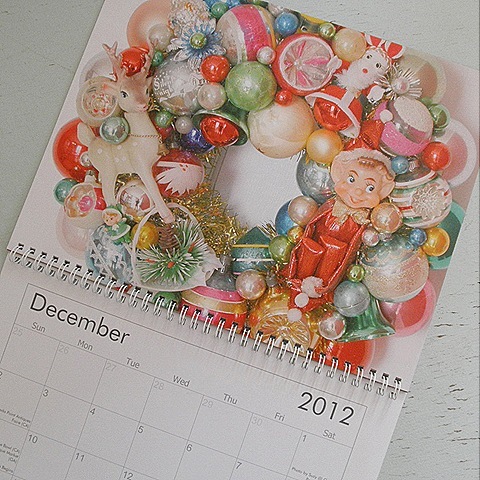 What's more perfect than a GeorgiaPeachez wreath for December! There are still several copies available here. What a delightful calender. December must be the best month! Hear, hear!! Thank you for the lovely wish! Wishing the same to you. Saw the name of you blog on someone’s blog list and couldn’t resist the name – glad I made the click! Love your blog and the calendar especially. What a great idea. I love that. And woohooo on your beautiful wreath there. It is sooo pretty and colorful. I love it.